November 16, 2018, Yangon – A Handover Ceremony for the Yoma Housing Project – Phase II for the poorest and most vulnerable families took place this morning in South Dagon Township in Yangon Region. 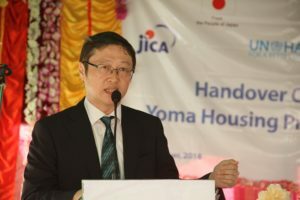 Yoma Housing was constructed under the funding of the Government of Japan/JICA and implemented by UN-Habitat. 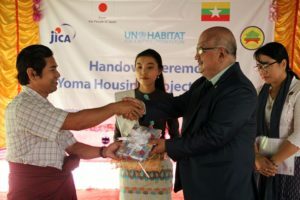 The Phase I of the project built 6 buildings (4 units – 5 storeys) and was handed over to 120 vulnerable families from Dagon Seikkan Township on 2 July 2017. 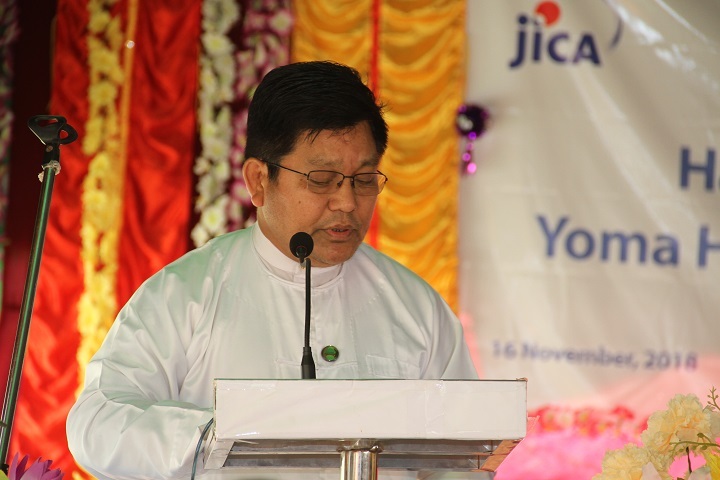 The Phase II, which has been recently completed, has 3 buildings (4 units – 5 storeys) with basic services and infrastructures, to accommodate a total of 60 poor and vulnerable beneficiary households from South Dagon Township in Yangon Region. The handover ceremony was jointly officiated by U Min Htein, Director General, Department of Urban and Housing Development (DUHD), Mr. Kazuyuki Takimi, Counsellor, Head of Economic and Development Assistance Section, Embassy of Japan, Mr. Kotaro Nishigata, Senior Representative from JICA, and Mr. Bijay Karmacharya, UN-Habitat Country Programme Manager. 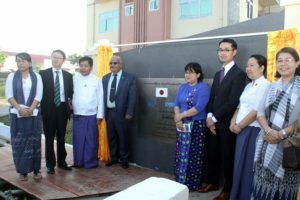 The event was witnessed by the beneficiary families, officials from the Ministry of Construction, Diplomats from the Embassy of Japan, invited guests and local officials. DG U Min Htein and Mr. Kazuyuki Takimi the Counsellor of Japan jointly unveiled the commemorative plaque to inaugurate the 3 newly constructed buildings. Occupancy certificates were also delivered during the ceremony to theselected beneficiaries from the poor and vulnerable families of informal settlement in the area. Land for the housing project was made available by the Ministry of Construction. Beneficiary families were chosen following a process of social mobilization and arduous beneficiary selection process based on vulnerability criteria. The community-based housing project has put targeted communities at the center of the process. Right from the beginning, they have participated of the selection of beneficiaries, they have taken active role of the construction, and were involved in the development of maintenance plan, and they will be in charge of the maintenance and operations of the housing project and its facilities. 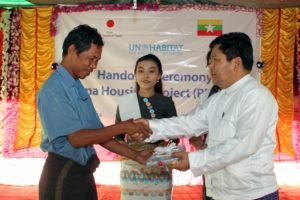 In his opening remarks U Min Htein, Director General for DUHD, MOC, stressed that this was a pioneering project which will contribute in defining approaches of solving the housing problems faced by poor and vulnerable families in informal settlements, through a systematic social mobilization process of consultation and participation of the beneficiaries. Mr. Kazuyuki Takimi, the Counselor from Embassy of Japan, in his remarks said that the Government of Japan has been supporting to Myanmar in three main areas that included Urban Development for Yangon City, improved transportation, and enhanced electricity and energy sectors. He noted that this Yoma Housing was a grant assistance for the purpose of housing construction for the poorest and most vulnerable in Myanmar and that was an expression of the goodwill sentiments of the people of Japan for the people of Myanmar. Mr. Kotaro Nishigata, Senior Representative from JICA expressed that the Housing Development was one of the key challenges Urban Area, population growth due to migration has resulted in lack of affordable housing. 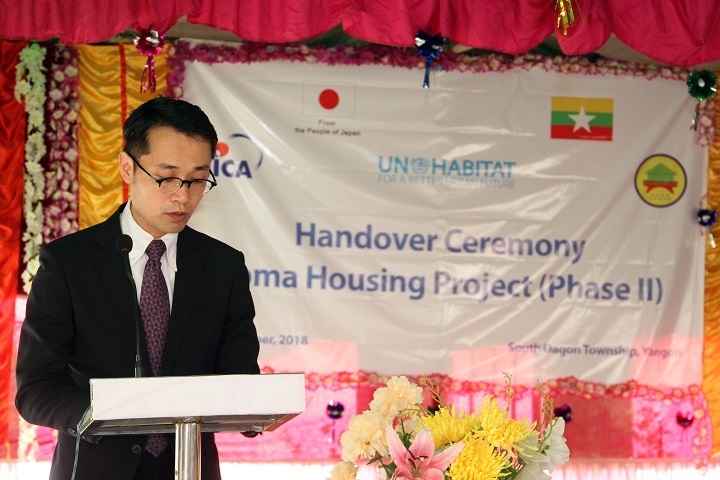 He also expressed happiness that the government and people of Japan could assist in putting some poorest and most vulnerable into decent and modern housing. 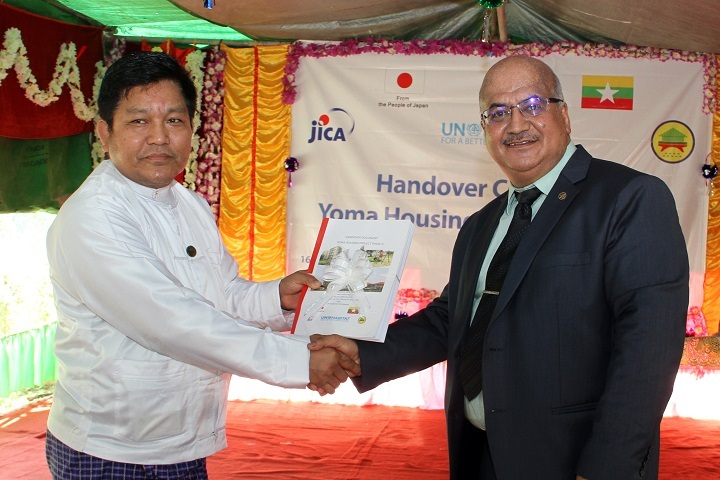 Mr. Bijay Karmacharya, Country Programme Manager from UN-Habitat, stressed that this project demonstrated a process of social mobilization and organization can lead to a successful completion of voluntary resettlement of informal settlements and move them to a dignified living conditions. The project also tested beneficiary selection process which will be helpful in dealing with the improvement of informal settlements in Yangon. 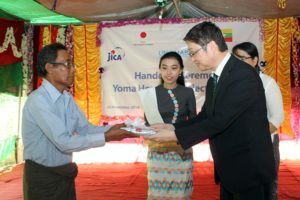 On behalf of the beneficiaries the chairperson of the beneficiaries’ committee Daw Thein Thein Zan expressed the great happiness of the beneficiaries and their deep gratitude to the Myanmar Government, Government of Japan, JICA and to UN–Habitat for their assistance to the vulnerable people. She recalled that the beneficiaries’ selection process was a lengthy, careful and rigorous process out of which only genuine beneficiaries were chosen. On behalf of the beneficiaries she reiterated a solemn pledge to cherish and maintain the bounty bestowed upon them. She also expressed her sincere gratitude to all for their supports to squatters who previously lived in poor condition. With the improvement in their living conditions, she expressed the hope that s that they will be able to improve their health, education and economic conditions. The Government of Japan is one of the strongest development partners of UN-Habitat; It has already funded various projects in Myanmar for improving lives, living conditions and basic facilities to poor and vulnerable group of people in the other parts of country.